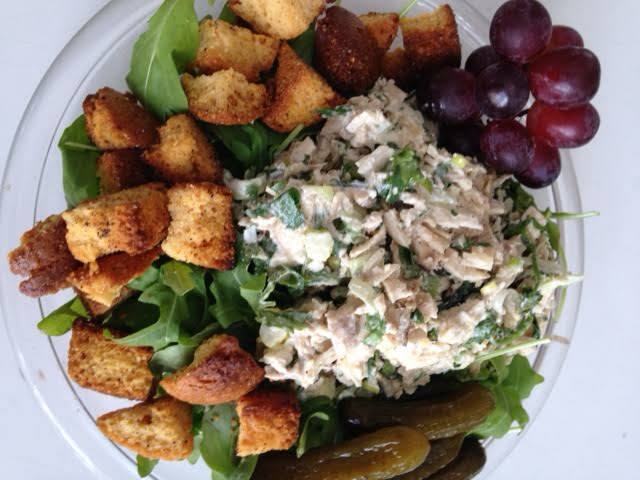 Chicken salad should always be made with delicious roasted or grilled chicken. I found this recipe on Pinterest and of course changed it up a little. Mix the chicken, avocado, scallions, cilantro, parsley,pickles. mayo, lime juice and jalapeno. Place the arugula on a plate. Garnish with more pickles, grapes and croutons. Next time I make this I will add 1/2 cup of corn.